Women’s philanthropy has emerged over the past 40 years as a field where women have invested their intellectual, financial, social, and cultural capital in order to improve the world around them. This project aims to highlight a “new frontier” that is sensitive to women’s approaches to giving. This project seeks to raise awareness within the field of Women’s Philanthropy, via a collaborative approach, by working with potential women philanthropists in communities around the world to develop networks and continuing education resources for leadership development. The Women’s Philanthropy and Leadership program complements work of other organizations, including the Women’s Philanthropy Institute at the Lily School of Philanthropy at Indiana University, Women Moving Millions, Women’s Donor Network, Women’s Funding Network, and Women’s Collective Giving Grantmakers. • Collaborated with the University of Monterrey (Mexico), including a two-day continuing education course on women’s philanthropy for 40 women leaders. • Collaborated with the Wisconsin Philanthropy Network to develop regional continuing donor education courses for individual and family philanthropy, including a replicable one-day curriculum. • Collaborated with 11 Women’s Funds in Wisconsin on joint projects and leadership development, including several one-day symposia. • Secured funding for future activities thanks to the Jacquelyn and Gregory Zehner Foundation. • Convene a one-day session for the Alliance of Wisconsin Women’s Funds to facilitate planning and provide educational opportunities to identify leadership development priorities. • Host a forum on women’s philanthropy in congruence with the 2018 4W Summit where we will discuss strategic thinking on women and philanthropic leadership in higher education. bibliography will be a repository of articles, a white paper detailing the state of the field of women’s philanthropy in higher education, and a PowerPoint and short video(s) featuring the voices of philanthropic leaders. 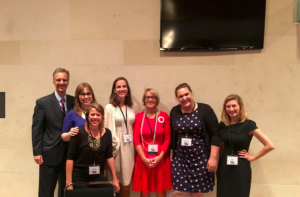 4W leader Martha Taylor (pictured here second from the right) with women philanthropists in Monterrey, Mexico in September 2017. 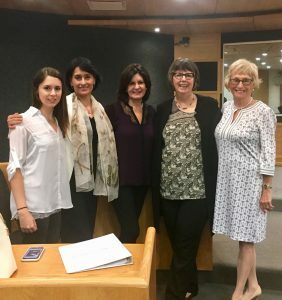 Sponsored by the University of Monterrey, Taylor and Sondra Shaw-Hardy (far right) taught a two-day certificate class in philanthropy and women’s leadership to an active group of women leaders. They are considering a giving circle and other strategies for impacting their community and beyond. While at the UM, Taylor also visited with faculty and students from the innovative nonprofit and civil society program areas. Feedback, questions or accessibility issues: odahlquist@wisc.edu.